"... a musical treat as we follow the story of legendary band leader Glenn Miller, and we aren't let down in our expectations. Applause begins even as the gentle strains of Moonlight Serenade rise to the occasion along with the opening curtain." "Clever script writing keeps the story alive and moving." keeps our feet tapping all the way." "There’s a fascinating few moments where Miller is rearranging the instrumentation to fix that sound he hears in his head and which eventually becomes the sound we all know so well." Bugle Boy was the nickname given to Glenn by Helen Burger, the girl who was to become his loyal and inspirational wife (even though his instrument was the trombone) who provided him with constant support and love during his formative years as a bandleader. 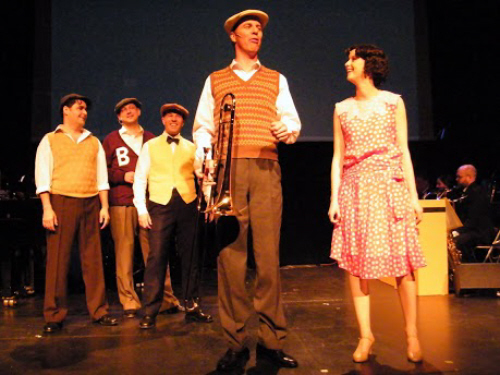 This musical is much more than just an orchestra on stage playing Glenn Miller tunes though... it's a love story, and one man’s search for a unique musical sound. Glenn Miller eventually succeeds in his quest for 'that sound', but he and his family only get to enjoy the fruits of fame for three short years. When America joins the Second World War after the bombing of Pearl Harbour, he joins the Army, forms the subsequently famed AEF Band, and flies to Europe to play to the Armed Forces. In 1944 he went missing in mysterious circumstances. On Friday, December 15, 1944, at 1:55 pm, the most popular musician in the world boarded an Army Air Force airplane at Twinwood airfield, Bedfordshire, England, on a flight bound for Villacoublay airfield, Versailles, France. The plane took off, but never arrived. Since that day, Glenn Miller’s disappearance has remained, for many, a mystery. 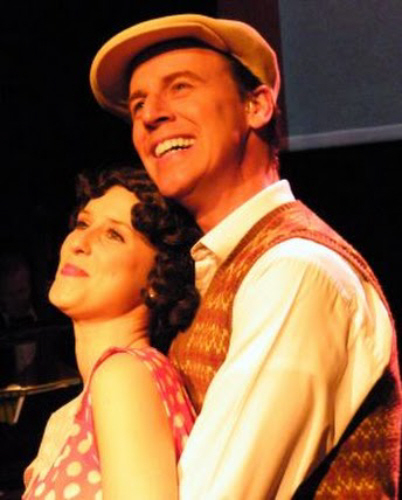 Sadly, like ‘ Titantic’, you know that this musical is going to have an unhappy ending, but Glenn Miller’s unique musical legacy weaves its way through an emotional and inspiring story line, and there is some joyous music and fun along the way. To obtain the distinctive ‘Glenn Miller Sound’ necessitates a band line-up balance of 5 Saxes, 4 Trombones, 4 Trumpets, Clarinet lead, Double Bass and Drums (and a piano is used as well). To obtain the equally vital harmony balance necessitates 3 male and one female singer only. College Friend 3 should be doubled with the least conspicuous of the actors playing Zeke Zarchy, Trigger Alpert and Jim Priddy. 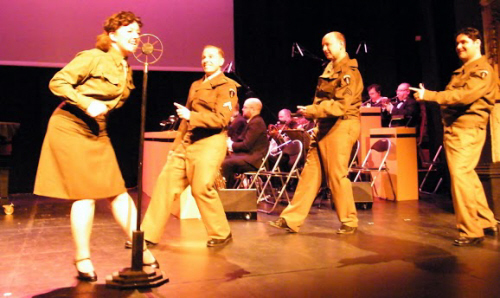 For Song #33: ‘Boogie Woogie Bugle Boy’ the ensemble shown may be replaced with three female singers in WAAC uniforms to resemble the Andrews Sisters. Here's a list of all the supporting material available and some other information you might need. Pricing for the production materials is supplied automatically with a Perusal Set. Royalty pricing can only be provided as a formal quotation. You can download straightaway a shortened copy of the script/libretto to read and get a relatively good picture of whether you would like to proceed to the next step. 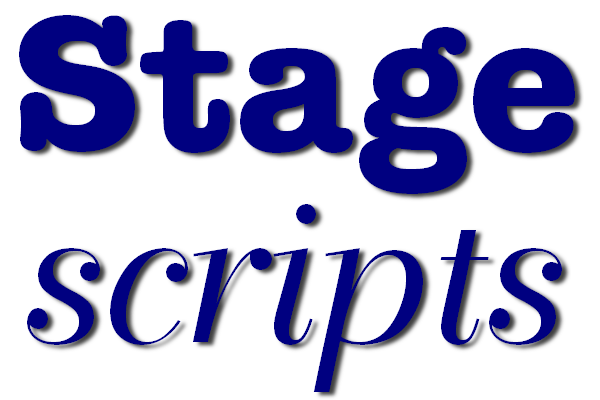 The Preview E-Script is made available to you as a pdf file sized for A4 paper and contains just over half of the script.libretto. Rehearsal Master Set on a Data CD (Cast). This contains the script and piano vocal score for your cast and crew provided as A4 pdf files. No problem about possible loss of deposit on rented paper scripts, as they are yours to print out and mark up as required. The price includes a multiple copying licence allowing you to copy the Data CD itself (enabling you to give or sell copies to your cast for them to make up their own rehearsal books) or to make multiple prints of the pdf's on the Data CD for your production company to organise and provide to your cast or crew. Please note that we do not sell individual printed copies of libretti, nor do we hire sets of printed rehearsal libretti or scores. These are available for a 16 piece orchestra as below, for hire to production companies only, who hold a valid, unexpired, licence to perform. Royalties for this title are 'variable fee, post paid', and will be calculated on a percentage of your box office income once your production has finished. See our pricing policy for details. We work on a quotation system for royalties, based on information you supply to us. Complete a printed application form or create account with us, and use the online version. We have secured the rights to video productions of this title from the Authors, and we manage them on their behalf. Once a 'Licence To Perform' has been granted, and then on payment of a fee, we will be able to issue a 'Licence To Record'. There are some strings attached to this, but these are far outweighed by the benefits.